There are 5 Business Finance Essentials you need to master. By understanding these 5 key business finance essentials, you can increase your company’s efficiency, market share & profits. Financial intelligence is essential in business. However, when it comes to understanding crucial aspects of your company’s financial statements and budgets, you may not be very interested. Maybe sales targets, marketing plans or product development are more your thing. 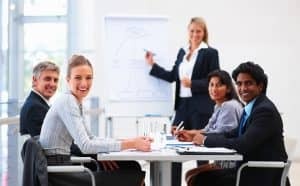 At Corporate Training Options we know that examining your company’s income statements, balance sheets, cash flow statements and budgets, may not be your idea of fun. But, having an understanding of your businesses finances does in fact have many benefits. The ability to design and run financial reports for your company gives you a wealth of information at your fingertips. Custom reports can be designed specifically for individual departments. The ability to report at the touch of a button allows you to make changes to your workflow and set and achieve specific financial goals for the business. Gaining expertise in reading the company income statement, balance sheet, and cash flow statements, allows you to then analyse these financial statements to determine income, expenses, profit and loss, cash flow projections and more. Having an understanding of key financial statements allows you to make improvements in the business, which in turn leads to improvements in the bottom line. By being able to thoroughly examine your financial statements using reports and financial ratios, you’ll obtain valuable information about your company’s ability to generate revenue and meet financial obligations. Although budgeting may be one of your least favourite things to do, it is necessary for effective financial management. Budgeting and costing are key components of business finance essentials. By learning and increasing your budgeting knowledge and skills, you and key members of your team can prepare and monitor budgets, manage cash flow for profit and evaluate which areas in the budget can be reduced or expanded to maximise profit and growth. Being able to identify trends and conduct competitive evaluations of your industry, is an important aspect of your company’s strategic planning. It is used to establish and monitor various trends in your business financials. Trend evaluation also supports and gives you in-depth information about how your company can be more competitive, and help you plan your company’s strategies, tactics and goals. Learn to use your financial statements to conduct both trend evaluations and competitive evaluations. Understanding financial formulas helps you assess your company’s performance in many key areas and can also help you with company investments. By learning, exploring and understanding your company’s financial formulas, including your Break Even Point, Operating Margin and Inventory Turnover Ratio, you will be able to easily track and monitor your company’s performance to identify what is working, and which areas need to be changed. Financial intelligence is essential in business — and tracking and managing your finances is necessary for prosperity and profit. Attend Training – This is the best way to learn how to take control of your finances. Training can improve your understanding of your finances, increase your financial literacy and ensure you’re fully informed before making financial decisions. Learn Financial Terminology – Learn the terminology, as this will give you a better understanding of your financial statements. Ask lots of Questions – If you don’t understand some areas of your financials, please ask. There are experts out there who can assist you, including your Accountant and/or Business Advisor. When you’re building a company, you need to continually strengthen every component – finance, strategic partnerships, executive team, and relationships. The CTO two-day course in Business Finance Essentials teaches company leaders and team members the fundamental aspects of business finances. The Business Finance Essentials course from CTO is ideal for accounts staff, team leaders, company Managers, and Directors. Trainees require no prior financial knowledge. For more information on how you and your company can operate more efficiently and maximise your profit through budgeting and understanding your businesses finances, please download the course outline – Business Finance Essentials.